25 Best WordPress Themes Compatible With WooCommerce Plugin! Creating an e-commerce website is an art that can be now easily done with content management system and widely known WooCommerce Themes platform. You don’t have to know about the coding knowledge like PHP, CSS, and HTML. Everything has been pre-built with ease of use with CMS. In that case, WordPress CMS is #1 best content management system to manage your content and selling products online and it has been made easy with plugins and modules. If you go deeply, you can find the #1 e-commerce WordPress plugin then everyone would say “WooCommerce” where you will get complete online e-commerce website solutions for selling your products. All you need to do is simply installed this plugin on the WordPress CMS and activate your WooCommerce themes. This plugin will take care from showcasing the products to delivering the products to the customers. There are plenty of WooCommerce themes available around the Internet, you may be wondering how to choose and which would be the best one for you to use! Don’t worry; we are the experts to find the right and best responsive WordPress WooCommerce Themes for you! Here, we have collected and listed the best WooCommerce themes to start to sell the products / goods. In this WooCommerce themes list, all of the WordPress themes are responsive and support to work on a smartphone, laptop, tablets and modern browsers. Some themes are very simple and lightweight to showcase and sell your products. These WooCommerce Themes will help you to create any kind of online shopping store to sell your products like clothing, sports accessories, furniture, baby clothing, apparels, women accessories, jewelry, watch shop, perfume, beauty products, software, mobile apps, mobile store, laptop store and all kind of online e-commerce websites. Please feel free to download these responsive WordPress WooCommerce Themes and suggest if you find any best WooCommerce themes. 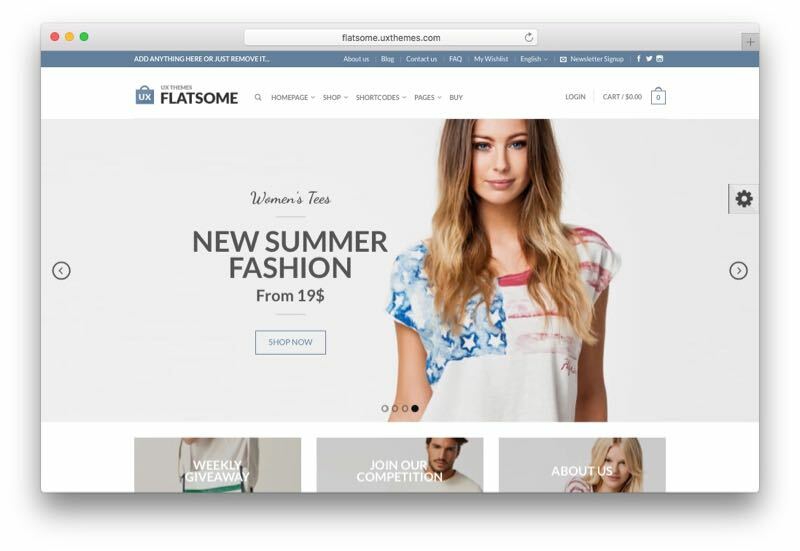 Flatsome WordPress Theme is one of the best responsive WooCommerce themes from UX Themes developer club. It comes with plenty of amazing features like drag and drops page builder to create your own custom page layouts for showcase and selling your products. Kallyas is a multipurpose responsive WordPress WooCommerce Theme from Hogash developer. This theme is coming with visual composer drag and drop plugin that allows you to design your own web page layout for selling the products. You will find plenty of amazing features like blog layouts, 11 header styles, post formats, skill bar elements, 100+ customizable elements for your e-commerce website and much more. Porto is a lightweight simple and elegantly designed responsive WooCommerce theme for WordPress CMS. Porto WordPress Theme is coming with 25 unique homepage versions, light and dark options, powerful backend admin panel options for customizing the design, unlimited color skin options and dedicated e-commerce web layout pages to choose and showcase the products. Shopkeeper is another wonderful responsive WooCommerce theme from Get Bow Tied developer. 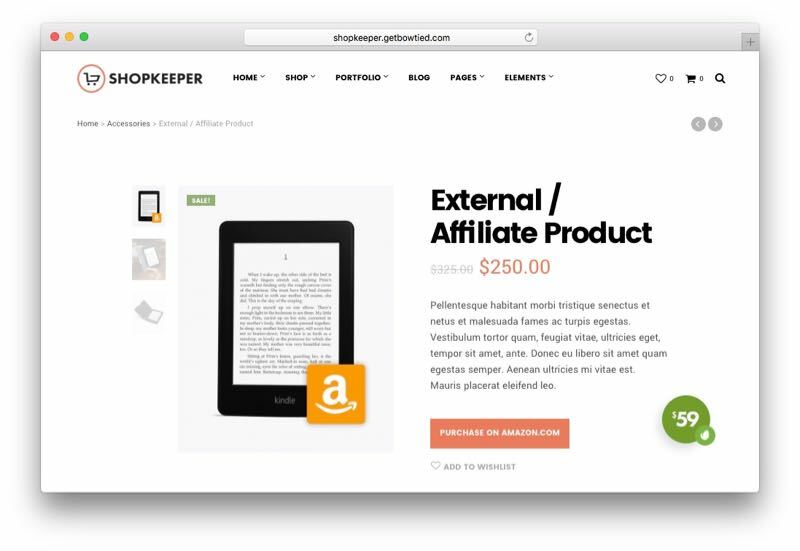 Shopkeeper WordPress Theme will help you to build a unique online e-commerce website with plenty of amazing features to sell shippable or digital products. It is fully customizable with drag and drops elements and it comes with lots of pre-built page layouts and advanced theme panel options. You will also see unlimited header styles, blogging style, portfolio functionality, amazing slides and much more. Shopier is a multipurpose responsive WooCommerce theme from Theme Yeti developer club. Shopier WordPress Theme is a highly customizable responsive retina ready and parallax web design. You can use this theme for any kind of online stores like fashion, clothing, food, furniture, shoes, sports and etc. Shopier Theme is coming with mega menu support, easy importing options, Visual Composer, drag and drop add-to-cart, 30+ shortcodes, unlimited headers and footer sections and much more. 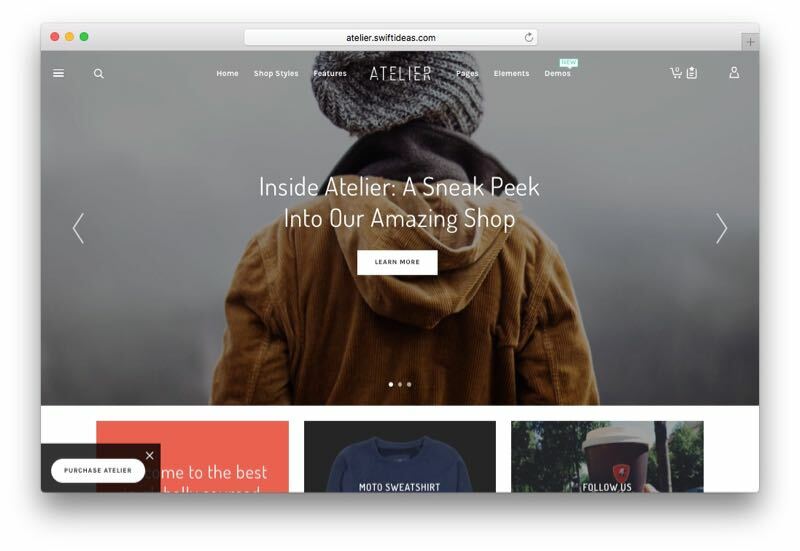 Atelier is specially designed responsive WordPress WooCommerce Theme from Swift Ideas developer. Atelier WordPress Theme is coming with 12 pre-built ready to use demo shopping store for selling products that includes Vario slider shop, Porter furniture shop, Flock furniture shop, Arad vintage furniture shop, Bryant one page shop store, Selby agency selling prints store, Émigré magazine selling magazines, Form Coffee Co theme for coffee selling store, Union store theme for selling beauty products, Tilt theme for gallery selling art prints store, Convoy theme for selling accessories and Lab Wines theme for selling wine store. It has been well planned and created with SEO optimized, 3 product post page variations, 10 header types, 5 cart animations, add-to-cart process, 3 cart styles, custom font icons, 4 product display posts, drag and drop page builder and much more. 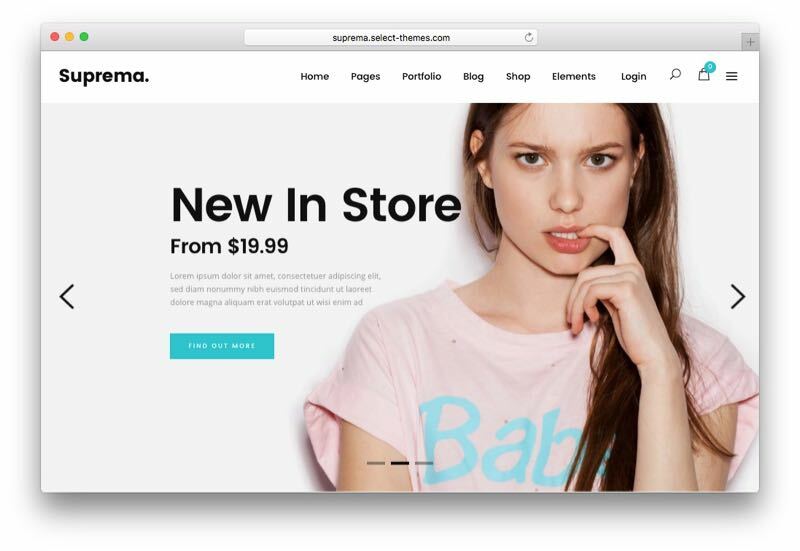 Suprema is another great responsive WordPress WooCommerce theme from Select Themes developer club. This theme is designed with a powerful framework and fully functional with drag and drop visual composer plugin that allows you to create your own desired web page layouts for your online shopping product pages and e-commerce store. Suprema WordPress Theme is coming with plenty of features that include slider revolution plugin, single product types, variable products, multiple shop lists, awesome menu styles, optional top header, wish list functionality, SEO ready features and much more. Basel is a professionally designed responsive Ajax based WooCommerce theme for WordPress CMS. Basel WordPress Theme is designed with popular drag and drops visual composer plugin and premium revolution slider to showcase the products. Basel Theme is coming with 9 pre-built and ready to use demo layouts that help you to create online shopping store for furniture, fashion, flower shop, bicycle shop, hero slider, the minimalist shopping store, lingerie store, watch shop and much more coming soon! Basel WordPress Theme is fully built with Ajax based shopping store, Ajax search, color shopping, 360-degree view and etc. Woodstock is a perfectly designed responsive and retina ready WooCommerce theme from TEMASH developer club. 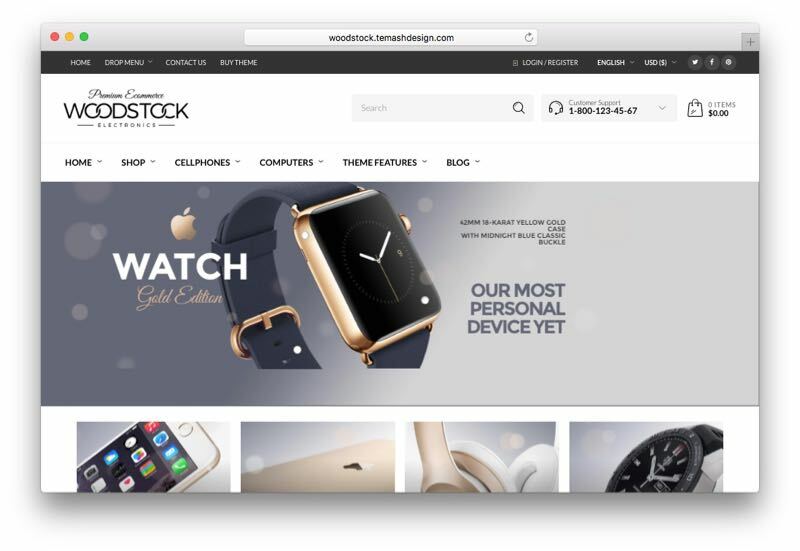 Woodstock WordPress Theme will help you to create all kind of online shopping store websites such as clothing store, electronics shopping store, furniture store, accessories shopping, online watch store and etc. Woodstock Theme is coming with light and dark version, built-in live Ajax search for products, crystal clear icons and images, off-canvas Ajax shopping cart and mobile menu, featured product videos, cart and checkout feature, built-in mega menu option, visual composer plugin and extensive documentation. The Retailer is a clean and modern responsive WordPress e-commerce theme for WooCommerce This theme is specially designed to use for all kind of online shopping store websites. The Retailer WordPress Theme is coming with responsive web design layout support, retina ready, visual composer page builder plugin, sell digital downloads products like ebooks, photography, music, design templates and etc. 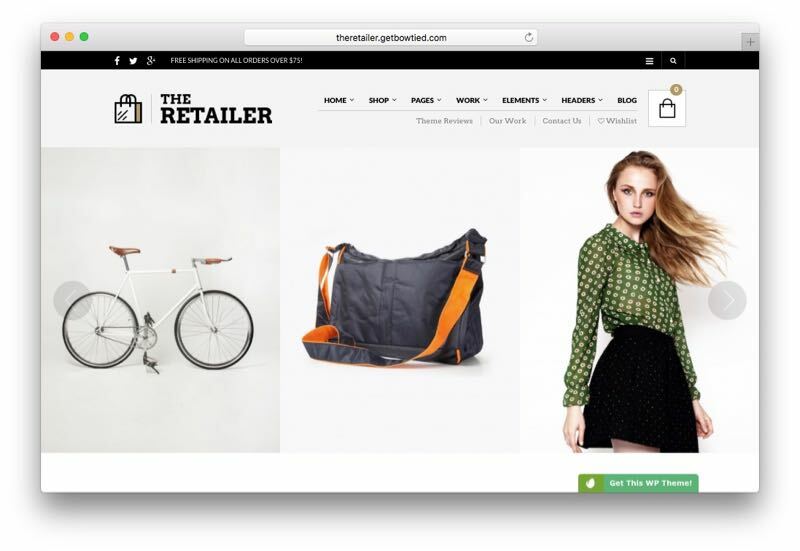 Even you can start your own affiliate business with The Retailer theme. Everything is controlled from the backend admin theme panel options and it has been built with some pre-built page layouts and 650+ Google font integrated, portfolio gallery and much more. 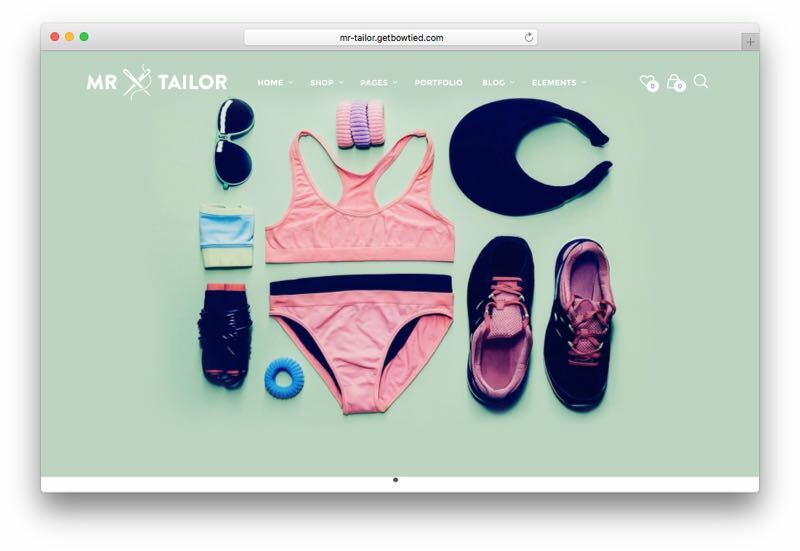 Mr. Tailor is a fresh and responsive online e-commerce shopping solution web design theme for WordPress CMS. Mr. Tailor WordPress Theme is specially designed to use for selling products around the world. It has been integrated with WooCommerce plugin and hassle-free updates, visual composer page builder, advanced typography options, fully customizable options, portfolio gallery to showcase the work and video documentation to install the demo content and create your online store. 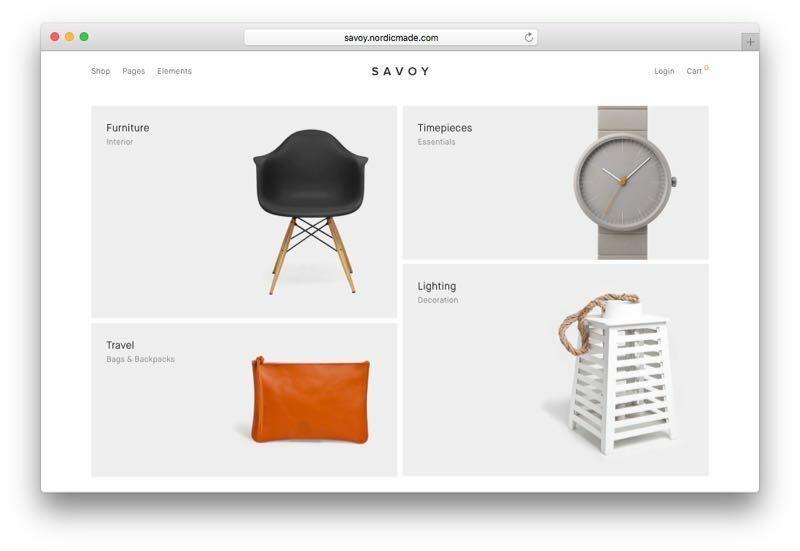 Savoy is a simple yet powerful responsive WordPress WooCommerce Theme from Nordic Made developer. Savoy WordPress Theme is a minimalist design that allows you to create a simple online shopping store to sell goods / products online. Savoy theme is coming with plenty of features like Ajax functionalities, responsive and retina ready, featured product videos, blog with grid / list view, touch enabled sliders and galleries, multiple column mega menu, lazy loading option for product images, highly customizable theme panel options, visual composer drag and drop page builder plugin and free automatic updates. 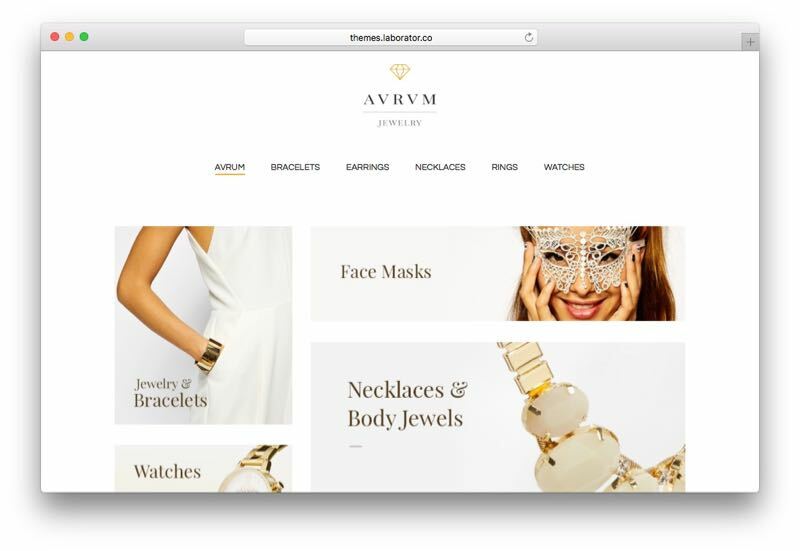 Aurum WordPress Theme is a minimalist responsive WordPress Theme for WooCommerce support. This theme is coming with very simple and lightweight design to load your website. You can create any kind of online shopping store websites like fashion clothing store, online jewelry and accessories shopping store, technology and gadgets store and online book selling the shop. It comes with plenty of features like welcome page and choose the regional state, RTL language support, mobile touch optimized, mega menu support, drag and drop page builder, transparent header, revolution slider, Google fonts, footer, blog and shop widget, contact page, products carousel, social media integration, 55 custom layout builder elements and detailed theme installation documentation. Royal WordPress Theme is another great responsive WooCommerce web design from 8theme developer club. Royal Theme is coming with 60+ pre-built demo web page design included that can be directly used to create your online shopping stores. Royal WordPress Theme has come with visual composer page builder, essential grid, ultimate plugin, master slider, slider revolution, live chat plugin, SEO optimized, awesome slideshow, unlimited headers, breadcrumbs, footers, advanced admin menu, Ajax based search modules and much more. 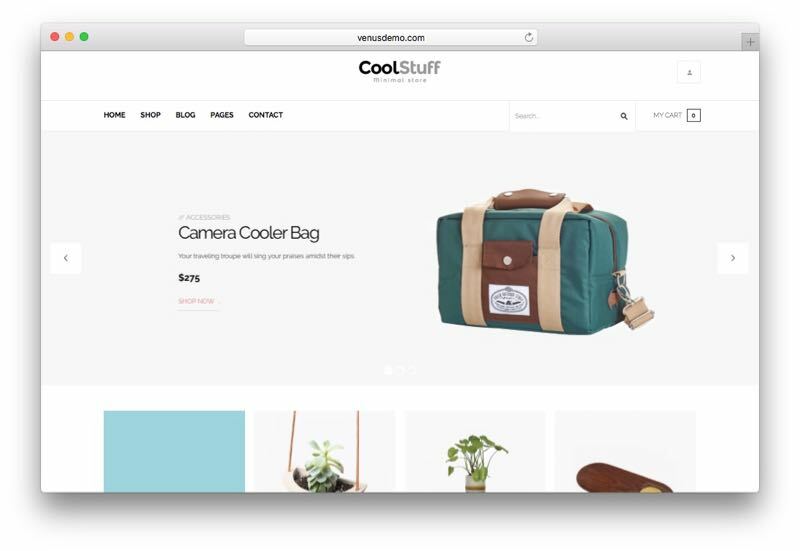 CoolStuff is super flexible online e-commerce WordPress theme to use for any kind of business models like décor store, furniture store and fashion accessories oriented websites. CoolStuff WordPress Theme is coming with plenty of amazing features 7 unique homepage variations, 4 colors (red, blue, yellow and default), bootstrap 3 grid system, grid view and list view, creative design, review integration, theme editor, visual composer plugin, translation ready, PSD files, parallax effects and compatible with popular WordPress plugins. 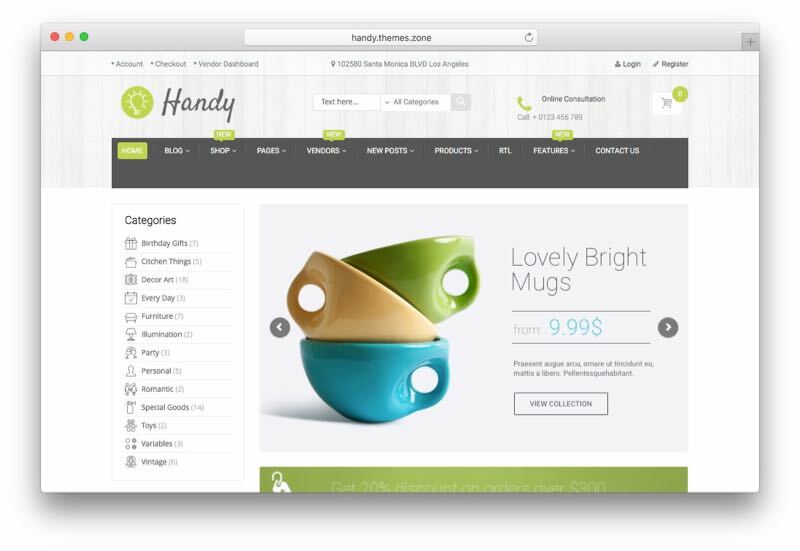 Handy is specifically designed a responsive WooCommerce theme for WordPress CMS from Transparent Ideas developer. Handy WordPress Theme is full and fully helping the handmade goods / products to sell online. But it can be used to create any kind of online e-commerce store websites. Handy WordPress theme is a stylish and modern design that comes with plenty of amazing features like custom layouts, static pages, blogging page, theme control panel, custom fonts, responsive and retina ready, unlimited colors and layouts, powerful admin panel, revolutions slider, SEO optimized structure, load speed optimized and extensive theme installation documentation. Legenda WordPress Theme is another great multiple purpose responsive web design from 8theme developer club. This theme is built with Bootstrap framework and it can be used for corporate websites, personal blogs, tech-based magazine websites and WooCommerce integration for creating the online e-commerce websites. Legenda WordPress Theme has come with plenty of features like Visual Composers page builder plugin, 15 pre-built online store page layouts included such as fashion shop, dark version, one page shopping store, parallax design, corporate, coming soon, underwear shop, transparent header, candy shop, car shop, games shop, video shop, toys shop, restaurant, watches and shoes shopping store. 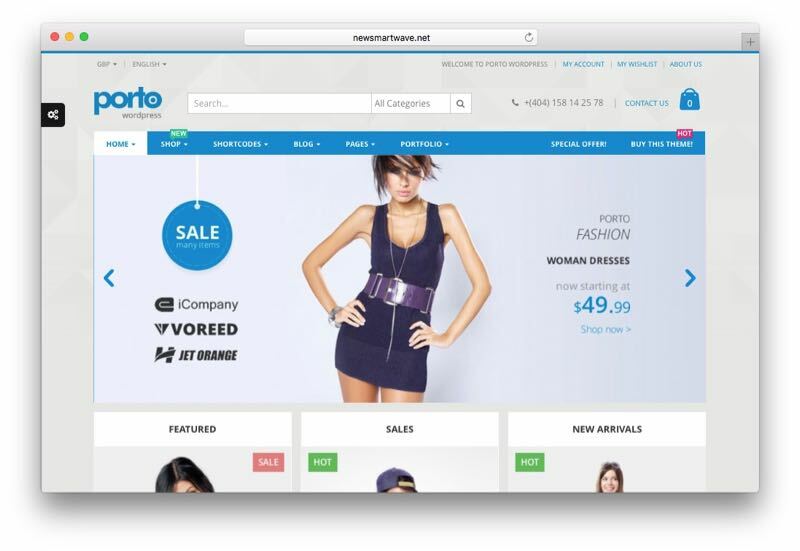 There are also some extraordinary features like video inside product review, BBPRESS plugin support, live chat plugin integration, revolution plugin, SEO optimized, visual composer plugin, QR codes generator, different store structure for your shopping website and much more. Organic Store is a responsive WordPress e-commerce theme from Axiom Themes developer club. Organic Store WordPress Theme is a colorful responsive web design that integrated with WooCommerce plugin to create your online store. 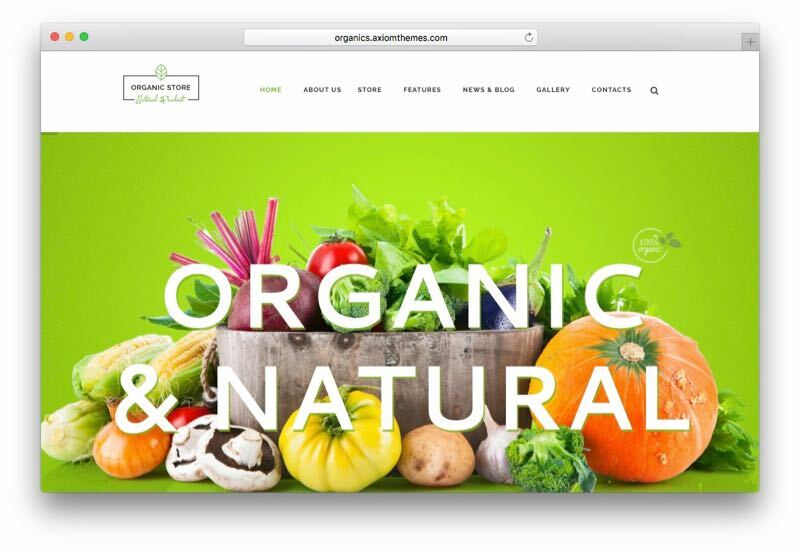 Generally, Organic Store theme can be used to create online shopping store for food and eco products such as agricultural business, agro-tourism, healthy food blog, organic food shop, organic farm, bakery and anything! Organic Store WordPress Theme is coming with amazing features to create your unique web page layout for your store, boxed and wide pages layout, visual composer page builder, hover effects, slider options, navigation options, built on powerful framework with customization options, lots of custom widgets, custom shortcodes, Ajax based search functionalities and extensive theme installation documentation and much more. Kingdom is exclusively designed responsive WordPress theme for Amazon affiliates. Kingdom WordPress Theme will help you to integrate the amazon store to your website and earn money from the advertising. You can easily create a customizable online affiliate store with Amazon website using the Kingdom WordPress Theme. It comes with plenty of features to showcase the Amazon products and pre-built page templates, full homepage builder, custom shortcodes, color filter widget and much more. Blaszok WordPress Theme is another great responsive WooCommerce web design that comes with 25 unique demo web designs included. Blaszok Theme will help you to create any kind of online shopping store and create a unique web page layout with page builder plugin called “Visual Composer”. There are also some additional features included with Blaszok theme, such as essential grid plugin, slider revolution plugin, layer slider, pricing table, MPC extensions, 22 custom shortcodes, 35+ header layouts, design styles, mega menu, SEO optimized, quick view, custom tabs, portfolio, parallax scrolling, theme layouts, page layouts for full width, sidebar right, sidebar left and 100% content width, blog with 9 post types, RTL support and much more. 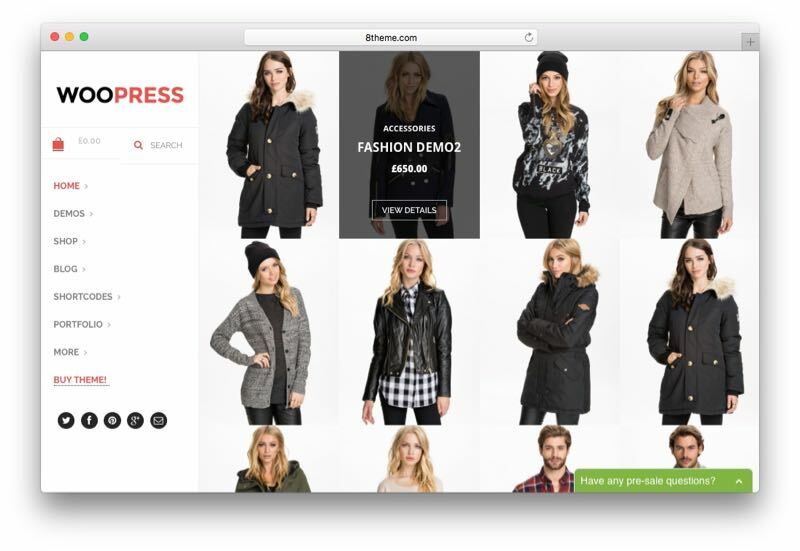 WooPress is a wonderfully designed responsive modern WooCommerce theme for WordPress CMS. This theme is coming with 20+ pre-built web page layouts ready to use for your online shopping store. 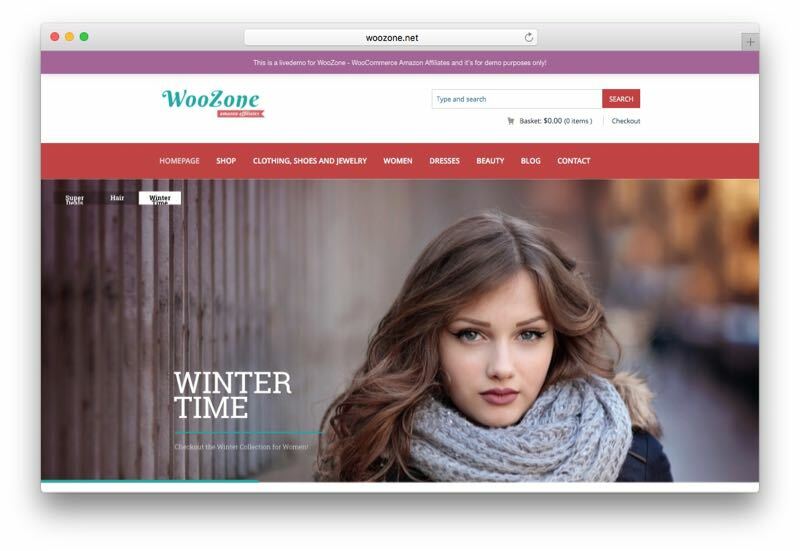 WooPress WordPress Theme is a powerful WooCommerce design that helps you to sell any kind of products online with A to Z e-commerce solutions. WooPress theme is fully responsive web design and retina ready support! It has been designed with very fast loading lightweight and SEO optimized structure. The backend admin panel options will help you to control the full customization and unlimited headers, breadcrumbs, footers, advanced admin module, awesome slideshow, unlimited colors, PSD files included and extensive theme installation documentation. 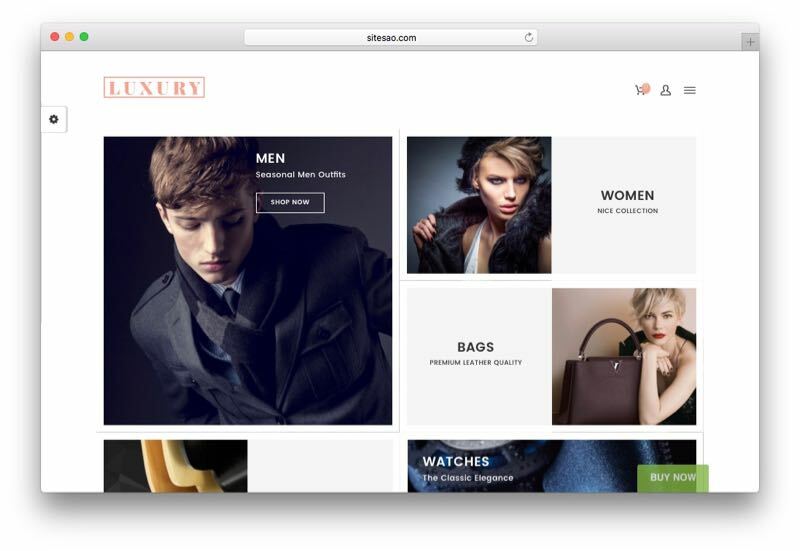 Luxury is an awesome responsive dynamic WordPress e-commerce theme design from Site SAO developer club. This theme is specially designed to use for all kind of online business websites that includes corporate business, e-commerce, personal blogging, tech news / magazine oriented websites and anything that you feel to start to use for your client / your websites. Luxury WordPress Theme is 100% support to work on WooCommerce platform that allow you to create a wonderful online shopping store from A to Z features with tons of fantastic features, such as unique concepts web page layouts, customizable header styles, minimal shopping page, visual composer drag and drop page builder plugin support, responsive and retina ready, unlimited color and skin, mega menu options, RTL language support, SEO friendly structure and lifelong free support and many more. 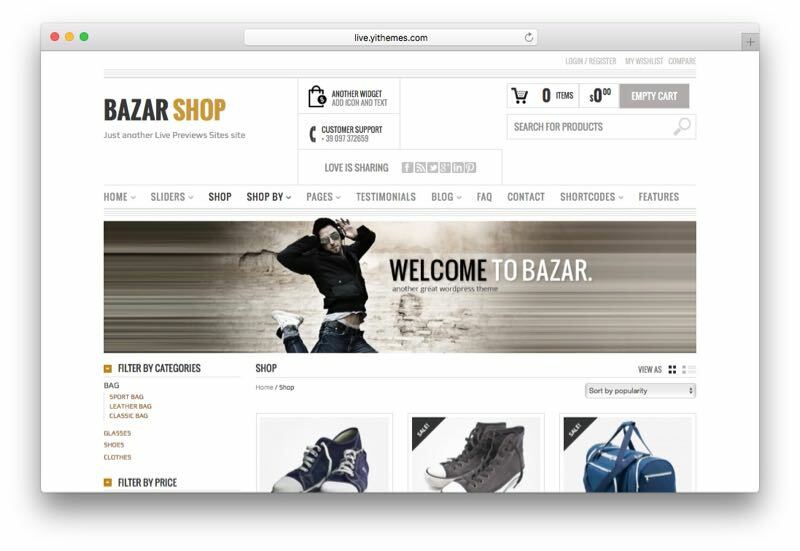 Bazar Shop is a dedicated responsive WordPress WooCommerce theme web design that comes with plenty of amazing features and unique web page layouts that ready to use on your shopping store. Bazar Shop WordPress Theme is coming with unique customizable features like create your own logo, widgetized + cart tab, top area, navigation menu, layout and background, header / slider, sidebar, footer area, upload your custom ribbon, wish list feature, share features for social media, compare features, product zoom feature, product variations (size, color, and so on), custom widget, pop-up included, list / grid view of products, 2 custom checkout pages, shortcodes manager, custom login page, extensive documentation support and free lifelong support! 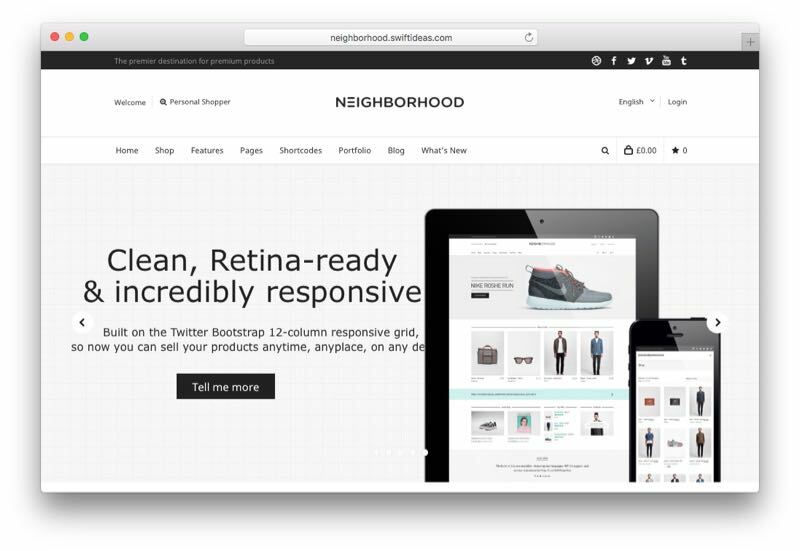 The neighborhood is specially built to use for WooCommerce web design! Neighborhood WordPress Theme will help you to build a wonderful online e-commerce web store from A to Z features to sell any kind of products / goods. You can create all kind of online products such as electronics, furniture, clothing’s, women’s accessories, sports accessories, tech gadgets, men’s accessories, fashion store, shoe store, glass and anything! Neighborhood Theme is 100% responsive and retina ready web design, valid HTML5 and CSS3, incredible Swift Page builder, unlimited color customization, wish list integration, full typography options, 600+ Google fonts, page layouts with boxed and wide options, footer options, layered PSD files included, 10 different background options, unlimited portfolio pages, full blog options, full page meta options, 40 page builder assets, 7 custom widgets, live color customizer and much more. North is another great responsive creative WordPress e-commerce theme from Fuel Themes developer club. North WordPress Theme is 100% fully compatible with WooCommerce plugin and it will help you to create any kind of online shopping store. 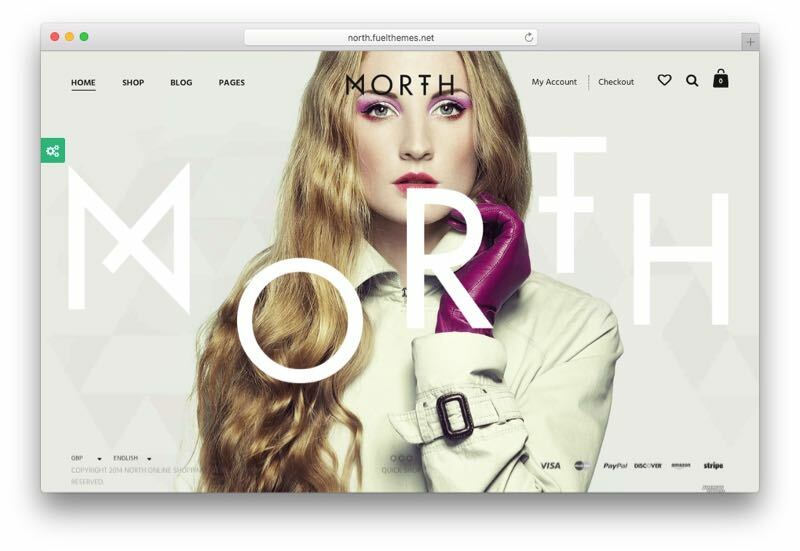 North Theme is coming with easy and flexible full-screen web layout to showcase your selling products/goods. You will see plenty of amazing features such as colors and background customizers, unique account pages, 6 exclusive plugins (Visual Composer, Slider Revolution, Table Rate Shipping, WooCommerce PDF Invoice, Dynamic Pricing and Discounts and product Filter), multilingual plugin, theme options, SEO optimized, pre-built page formats, RTL ready, drag and drop elements, child theme support and extensive theme documentation for installation and free support!